Returns if the notifier is enabled. A utility class for asynchronous notification of socket activity. Use a socket notifier to integrate listening for socket events into the Wt event loop. In this way, you do not need a separate thread to listen for socket activity. 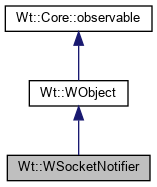 Socket activity is either the availability of data to be read (Read event), possibility to write data (Write event), or an exception that occurred (Exception event). When an event on a socket is available, the notifier emits the activated() signal. As in the case of a user interface event (like for example WInteractWidget::clicked()), you will typically modify the widget tree in response to the event. But, unless you use a timer (WTimer) or use server-initiated updates (see WApplication::triggerUpdates()), these changes are not propagated to the user interface, until the next user interface event. Like other events, socket notification events are serial (not simultaneous), and there are no thread safety issues (you don't need to take the WApplication::UpdateLock). Creates a new socket notifier. Create a new socket listener to listen for events of given type on a socket with file descriptor socket. The WSocketNotifier is enabled after construction. The signal is emitted when an event that was waited for is available. The signal argument is socket(). Enables or disable the notifier. By default, the socket notifier is enabled to receive events. When disabled, no events will be notified (as if the socket notifier didn't exist).